Question 1 Name the flap which closes the glottis to check the entry of food into it during swallowing? Question 2 What happens to the diaphragm when diaphragm muscles contract? 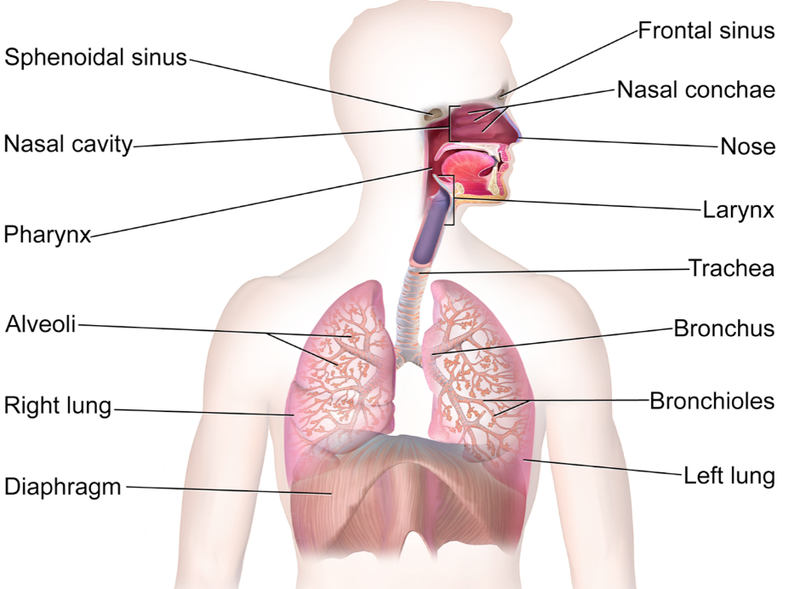 Question 3 Name the cavity in which the lungs of man are enclosed.What is its function? Question 4 State the function of epiglottis? Question 5 Explain the path of transfer of oxygen from trachea to tissue cell? Question 6 Respiration is a vital function of body.Why? Question 7 Explain the mechanism of gaseous exchange between tissue and blood? 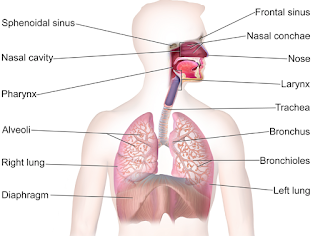 Question 8 Describe the respiratory system in human beings? Question 9 Name the respiratory pigment in humans? Question 10 What is diaphragm? Terrestrial animals can breathe the oxygen in the atmosphere. Animals that live in water need to use the oxygen dissolved in water. Rate of breathing in aquatic organism is much faster than seen in terrestrial animals because amount of dissolved oxygen is low in water than in the air. 1)Nose:There is a pair of external nostrils at the lower end of nose.The air enters through the nostrils.The air passing through nostrils is filtered by fine hairs that lines the passage.The passage is lined with mucus which help in this process. 2)Throat or Pharynx:The nasal passage open behind into pharynx.It is a common passage for food and air.It leads into an air tube called trachea through a slit called glottis.The glottis always remain open except during swallowing.The glottis bear a flap called epiglottis.During swallowing epiglottis closes the glottis to avoid entry of food into air pipe. 3)Trachea:It is a thin walled tube that extends downwards through the neck and divides into 2 major bronchi.One major bronchi enters right lung and other left lung. 4)lungs:In humans,the respiratory organs are lungs which provide the surface for the exchange of gases.The lungs lie in the thoracic cavity on the sides of the heart. The thoracic cavity is separated from abdominal cavity by muscular portion called diaphragm. Each lung is enclosed in two membrane,the pleura. 5)Bronchi and bronchioles:Within the lungs the major bronchi further divide into secondary bronchi which sub-divide into small tertiary bronchi and finally into bronchioles. Each bronchioles divide into alveolar duct which enters the alveolar sac or alveoli.The alveoli are made up of non-ciliated squamous epithelium cells.It is surrounded by network of blood capillaries. 1)When we breathe in,chest cavity become large due to lifting of our ribs and flattening of diaphragm.Because of this,air is sucked into lungs and fills the alveoli.The blood brings carbon dioxide from rest of the body and release into the alveoli,and oxygen in the alveolar air is taken up by blood and transported to various cells in our body. 2)When air is taken in and let out,lungs always contain a residual volume of air so that there is sufficient time for oxygen to be absorbed and carbon dioxide to be released. In humans respiratory pigment is Haemoglobin which has high affinity for oxygen.